I held onto the steering wheel like death. It took all my strength to turn the car into the Dairy Queen parking lot. Something was seriously, dangerously, sure-to-be expensively wrong with my ancient red Dodge Colt. I ‘d been driving South on Route 1 in Maine, on my way home from Canada. It was a fun ride, past blueberry stands, clam shacks, fishing boats, and souvenir shops. But the fun had just vanished. I took the first cross road I came to off the highway. I’d gone and done it–broken my number one rule about driving alone on road trips far from home. That rule was to stop before 5 p.m. when the service stations in small towns close for the night. It was almost seven. I didn’t know exactly where I was, but I knew I was still many hours from my home in upstate new York. The girl at the takeout window of the Dairy Queen was bored. If she noticed or cared that I was desperate, a single woman stranded in the early evening in a car that couldn’t travel another mile, her concern didn’t show. She showed more animation: “We aren’t allowed to let customers use the phone,” she said emphatically. I was on a local road off the highway. Modest homes, but no other businesses. I might walk aimlessly for miles, never passing a gas station or a motel, or a phone. A man walked towards me from a rusty pickup that looked even older than my defunct vehicle. He was wearing worn jeans and sneakers. He needed a shave. “Lady, something is dragging on the ground under your car. Come look.” I followed him back to my car. Sure enough, a long metal bar was dragging on the ground. I had no idea what it was, but I was pretty sure it was supposed to be attached at both ends to the car. Well, I thought about it, but not too long. I was somewhere in Maine & my car was broken. It was dusk. This guy promised me a mechanic just up the road. The man went to talk to the woman sitting in the passenger seat of his truck. By the time he’d come back, I’d made my decision. If I could get my car to move at all, I’d follow the man, the woman, and the pickup truck. My car started up. I clutched the wheel & it groaned up the road to the fifties ranch house a few doors away. By the time I parked, my rescuer was on the front door ringing the bell. Again and again. “Not home,” he said. I’ll leave him a note,” And he went to his pickup for paper and a pen. I saw him talking to the woman but I couldn’t hear what he said, and couldn’t read the expression on their faces. He walked back and stuck a note in the door. Then he and his wife came to me. Well. I thought about it. My car was dead on someone’s driveway. He wasn’t even home, and the service stations were closed. I didn’t know where the motels were. “Thank you,” I said. I got my suitcase. I took out the car keys. “Dave’ll probably need your keys,” he reminded me. Both looked at me, puzzled. The wife spoke up, “You’re not in New York now. You’re in Maine.” That seemed beyond refuting, so I got in their pickup leaving my keys in my unlocked car. The couple’s house was tiny and worn, like their pickup. It occurred to me that leaving my car somewhere (I didn’t know the address) with a mechanic whose last name I didn’t know and whom I’d never met, to spend the night with total strangers (whose names and address I also didn’t know) in some unknown town in Maine—had some elements of risk. Suppose these people were psychopathic ax murderers? Just in case this was the last night of my life and I never left this little house, someone should know the names and address of these people. “Do you mind if I call my friend, Judith?” I asked. “We have a routine. Whenever I’m traveling, I always call and let her know where I am.” I held the pencil poised over a piece of paper, with a sweet, trusting, sincere expression stuck on my face, waiting for them to tell me who they were. On the other end of the line, Judith’s voice sounded odd. No doubt she was surprised to hear from me. She’d certainly be writing down their names and addresses. To be honest, in the past, she had expressed reservations about my common sense and judgment. No matter: my children would know what happened, should something happen. The three of us sat and chatted until bedtime. Seems they were members of a religious group. They talked about it for hours. “Not a church, exactly,” they said. Their leader had seemed inspiring at first, a real holy man. But lately he was getting suspicious and domineering, trying to control the behavior of everyone in their group. They gave me scary examples. “It’s no religion. It’s a sect!” I thought. Stories of crazy sect leaders and mass suicides crossed my mind. “The thought of dying before morning resurfaced, though I wasn’t sure why members of a sect would want to murder stray women travelers. That night I went to the bedroom, thinking about self-preservation. I tried to move the dresser in front of the door, but I couldn’t move it—at least not silently. I looked at the open second floor window. I wondered if I could drop to the ground safely and decided I could not. I got ready for bed & lay gazing at the ceiling. The night seemed endless. I wished I were anywhere else. I finally fell asleep and slept late the next morning. When I awoke, the sun was streaming through the window. I noticed for the first time the ruffly curtains and a couple of girlish stuffed animals & knickknacks on the dresser. I washed and dressed, packed my things, tidied the room and went downstairs. I could smell coffee brewing and something baking. Good news. Dave had arrived home the evening before and fixed my car. He’d found a used part to replace the crankshaft or driveshaft or whatever the heck it was. The car was now sitting in the driveway. I owed him $50 for parts and labor. I knew this had to be less than the going rate. We shared breakfast in the little dining room. Turns out the wife had baked three different kinds of muffins while I slept. I felt foolish and ashamed of my suspicions. I hadn’t even been thinking of them by name. Beth had cooked blueberry, cranberry, and bran muffins while I slept. Jim asked me how I’d slept. They flatly refused to let me give them anything. I left Maine, and headed home. Later, Judith gave me a stern lecture about my stay with strangers. To her dying day, she believed I’d acted like a darn fool and that it was not human goodness that saved me, but dumb luck. I think she was wrong, and I’m glad. I’d reclaimed a measure of trust in human goodness. My mother and I shared a passion for hokey things. 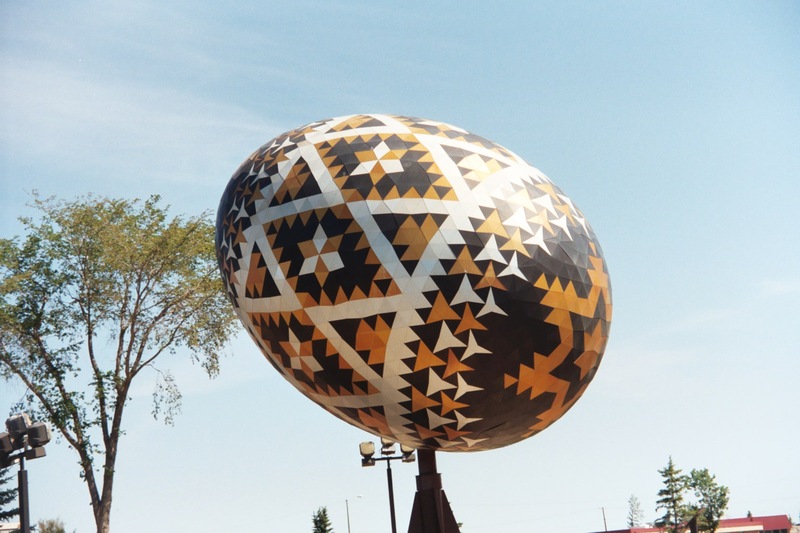 Happily, Alberta, where she lived, has more giant, hokey roadside attractions per capita than any place on earth. Together, she and I saw the giant honeybee, stalk of corn, cowboy boot, oil derrick, and beer can. We’ve had our picture taken beside the forty-two foot kielbasa sausage near the Stawnichy Meat Processing Plant in Mundare. We’ve traveled to Drumheller, home of the Alberta badlands, piles of dinosaur bones, and the prestigious Royal Tyrrell Museum of Paleontology. People there decided they needed more, a sure-fire tourist attraction. So they built the world’s largest T-Rex. 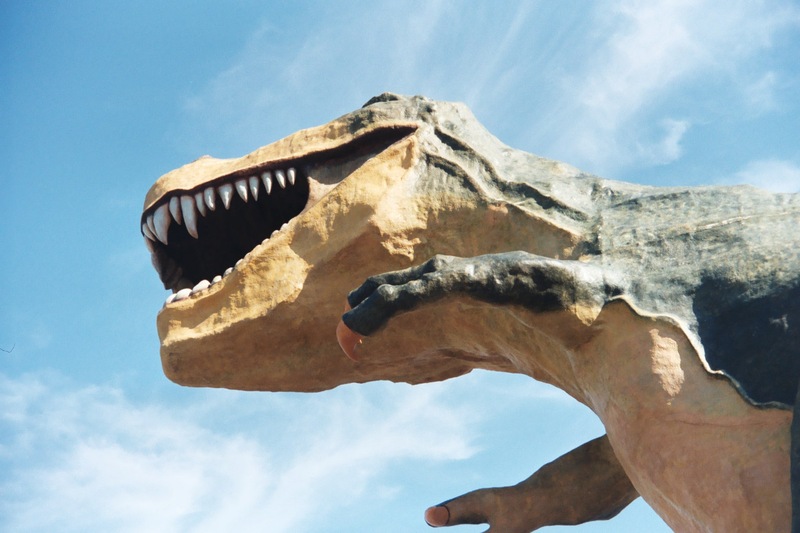 It’s eighty-six feet tall, four times the size of a real dinosaur. I’ve climbed up the stairs in her neck and took pictures of the badlands between her giant teeth. 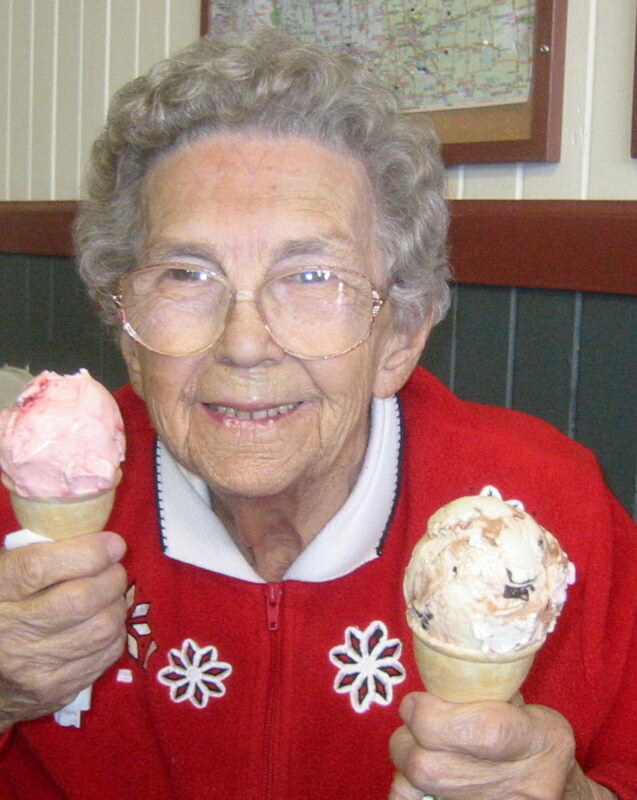 But by the time Mom was ninety, her traveling days were almost over. Her heart and kidneys were failing. She was legally blind and painfully arthritic. Her short term memory was shot. But she still loved to travel, wanted to travel. My sister-in-law Patti and I decided to take Mom on one more road trip, to the world famous Gopher Hole Museum in Torrington. Edmonton. Mom ordered the clam chowder. When it was served, she stirred it a bit, looking for clams. She couldn’t find any. She whispered loudly to us, how down east where she was born, you could get a decent bowl of clam chowder. The waitress came to refill our coffee mugs. The young waitress didn’t bat an eye. “Oh,” she said sweetly, “We never put clams in our clam chowder.” And she left to wait on another table. My mother could barely control herself. And she was still complaining about the chowder later that day when we pulled into Torrington, population eighty-six. We knew we were in the right place. 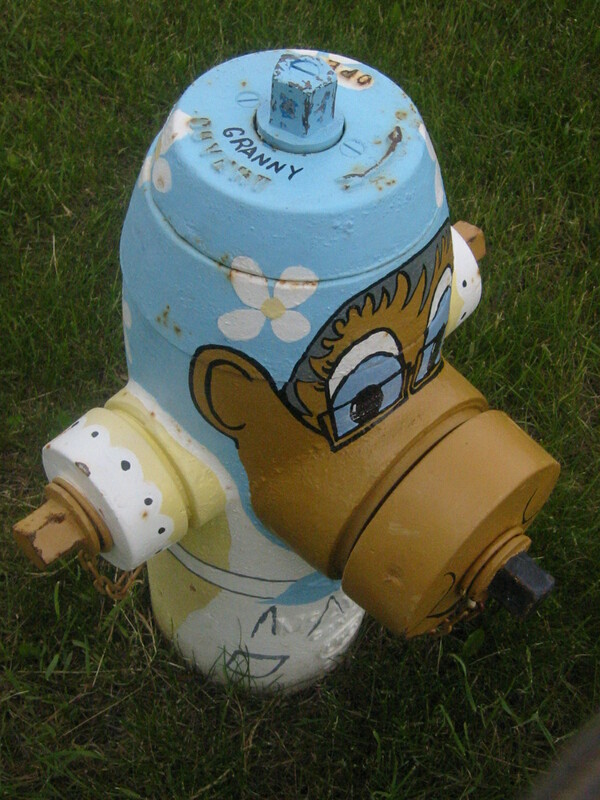 A giant twelve foot gopher named Clem T. GoFur greeted us in the park, and all eleven fire hydrants were painted to look like gophers too. I was in for a surprise. If ever there was a museum in bad taste, if ever there was a politically incorrect museum, this was it. I gotta say…we loved it. 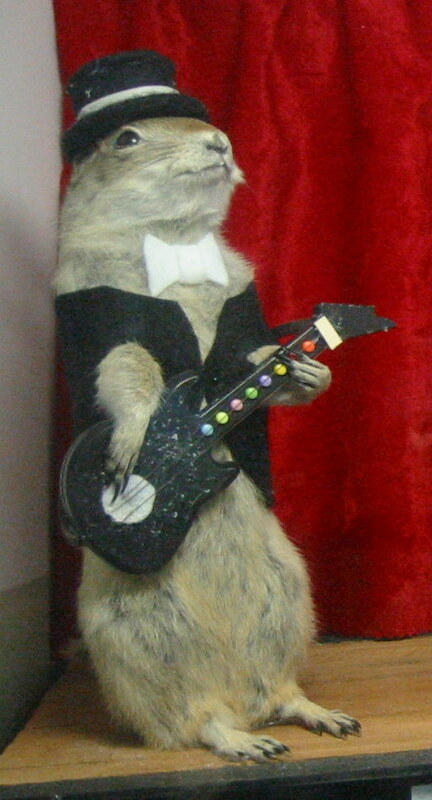 In Torrington, dozens of gophers are stuffed, dressed, and placed in dioramas. There is a beauty parlor with gopher customers and a gopher beautician. A church with a gopher congregation and a gopher minister. Gopher cowboys and gopher Indians. Gopher covered wagons. Gopher Royal Canadian Mounted Policemen. As I recall, she didn’t express any sympathy for the creatures, whatever they were. She wasn’t that kind of woman. The docent chatted with us for awhile. She told us that the people in town and from nearby farms get together in the winter to discuss what dioramas they’ll add the following spring. They decide who will sew the costumes and make the furniture and scenery. “We can’t use roadkill,” she added, helpfully. I thought about it. Made sense. “We stopped at a restaurant for lunch. I ordered clam chowder, but I couldn’t find any clams. The waitress told me they never put clams in their clam chowder. Can you believe it?! I never heard of such a thing! Just so you know, some other giant roadside attractions in Alberta are a trumpeter swan, a bighorn Ram, a peace dove, a freedom-loving pig, a blue heron, a goose, a beaver, an antelope, a moose, a bison, a skunk, crows, a walleye, a mosquito, a mallard duck, a swan protecting her nest from a grizzly, a mushroom, dancing potatoes, a sunflower, a Pinto Bean, a brown-eyed susan, a pumpkin, a crown, a cream can, a milk bottle, a lamp, a piggy bank, a badminton racket, a softball, a baseball bat, a golf putter, 100’ survey markers, a giant wind gauge, a sundial, a weather vane, giant pincers, a chuckwagon, a saddle bronc and rider, a wagon wheel, a cowboy, a brahma bull, and a 215’ teepee. And I almost forgot–a UFO landing pad and a Vulcan space ship with greetings in English, Vulcan, and Klingon. And you thought Alberta was just Banff, Lake Louise, Jasper, the Calgary Stampede, a really big shopping mall, and oil fields.